There is a very powerfull user Interface wrapped around youtube-dl which will allow you to download mass video's from youtube. Powerfull - The commandline is actually your friend, using It wisely will not only teach you to do your job faster and have fun while doing it! We will be using youtube-dl which is a Python script that can download video's from Youtube.com. This is how the normal flow works when you want to run a specific program that requires another program. Think about Flash, Games, Java.. You need to install other pieces of software to support then. For example for the youtube-dl you would also need to download Python and other dependencies. Most people prefer User Interfaces because it looks easier, a few clicks and you're done. But the command-line is a very powerful ally. The good guys at youtube-dl provided us with a direct executable that has everything it needs to work directly out of the box without you requiring to install python and other dependencies to make it work. For the purpose of our tutorial you will want to save the executable to your Desktop. In normal circumstances I would advise you to create a special folder and save it there but to keep it simple we'll use the desktop. You can also create a special folder on the desktop or anywhere else and save it there. There are a few things to notice. Your current directory is your username's home directory. Mine's residing on the C: partition. You can then type cd Desktop which will change the directory to Desktop. 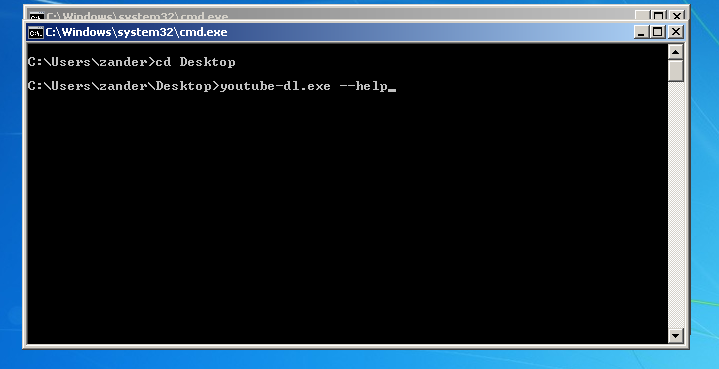 Then you can type youtube-dl.exe --help to get a list of command modifiers you can give to the youtube-dl program. You can now download any youtube video using. It usually saves the video in mp4 format. Download ffmpeg static builds from https://ffmpeg.zeranoe.com/builds/ Then unzip it into C:\ and you'll notice a very long name, rename the folder to ffmpeg. What we actually want is to just use ffmpeg everywhere we are. To acheive that we need to set the path variable (you can type path in the cmd to what it contains). NOTE that the following command will truncate (eliminate) all other path functions from your path. Or you can copy the contents from the ffmpeg\bin folder to C:\windows and you can save a lot of time and issues. Note, you need to be admin..
Magic stuff happened! We now have a mp3! Some will say "but your blog is about Linux.. and you're going Windows??" Yes.. It's about Linux, and I want all windows users to start using Linux. Linux is much easier.. It's faster. It's much more customisable.. It's the thing your grandma should be using so you don't have to reinstall her pc every 1 month. But warning, Linux is addicting! Which will take care of downloading the program for you along with any dependencies.